Weekly government briefings about swine flu have been abandoned, a signal that the crisis is considered to be easing. Figures show the number of new cases in England has fallen dramatically over the past month - from 9,000 over a week in December to under 5,000 last week. The Department of Health said the briefings would be scrapped until there were any fresh developments. It said it would now use fortnightly bulletins to keep journalists up-to-date with statistical trends. A government spokeswoman said: "Given the lack of sufficient new content, the department has decided to stand-down the weekly swine flu briefings. "However, if there are any emerging developments we shall restore these. "To ensure that journalists are kept up-to-date with statistical trends, a fortnightly bulletin will be issued starting Thursday 21 January together with an interpretative quote from the chief medical officer." Although the number of cases of swine flu has fallen to a low of below 5,000 in England in the past week, the number of people in hospital after being infected has not dropped to the same extent. There has also been a striking increase in critical care admissions in the over-65s who make up a quarter of the 103 patients currently taking up intensive care beds. This could partly be due to the cold weather but the reason is not yet entirely clear. 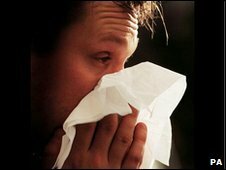 Since swine flu was first reported in April 2009 there have been 360 deaths across the UK - 251 in England, 28 in Wales, 64 in Scotland and 17 in Northern Ireland - mostly in people with underlying health conditions.